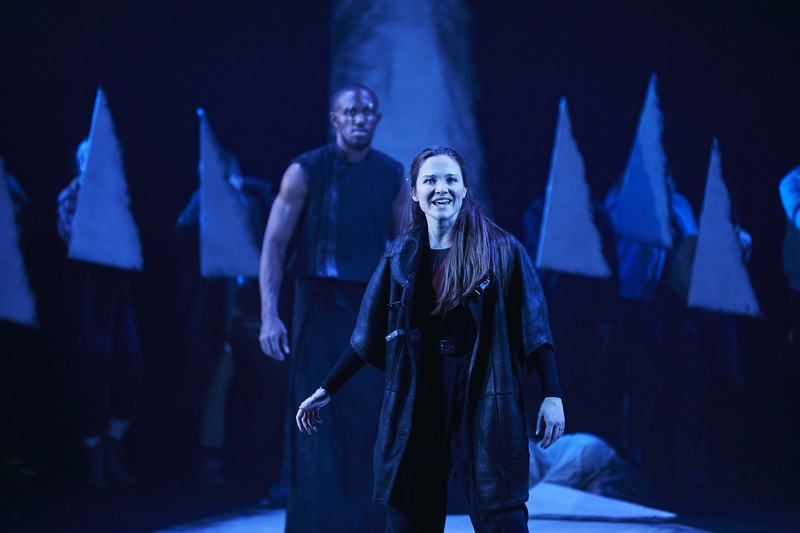 Oseloka Obi and Olivia Dowd in Macbeth at the Garrick Theatre. Photo: The Other Richard. Yes, it’s Macbeth yet again—with something of a twist this time: it’s the National Youth Theatre and their company of up-and-coming performers. And this does add a genuinely different angle to the affair, especially considering that most of the other productions of the past year have anchored themselves around a star in the titular role. Such stardom serves as anchor and justification: Rory Kinnear wants to play Macbeth, what more reason do you need? What do you mean what is the play about, haven’t you noticed that’s Christopher Eccleston? Director Natasha Nixon and adaptor Moira Buffini have, in contrast, built in opportunities for everyone in the ensemble to get a chance to shine—though perhaps inevitably (but well-deservedly) none more than Olivia Dowd as Macbeth herself. Dowd delivers crystal-clear verse and carries herself with a mature weightiness, particularly in her early scenes. The creeping advancement of her ‘black and deep desires’, and of the unravelling guilt that follows the murder of Duncan (a solid and sensitive Marilyn Nnadebe), appears like cracks in a frozen lake—gradually, and then all at once. Isabel Adomakoh Young makes particular sense of Lady Macbeth’s distress at her wife’s increasing distance. More than in many productions, their descents into frenzy seemed parallel: was what they’d done worth it? What had it even been for? There’s something delightfully logical in watching such a young Macbeth and Lady Macbeth fumble to make sense of the choices they’ve made. Why should they know what to do with their anxious, churning ambition, except leap into the first option that presents itself? And is it any wonder they don’t know what to do with themselves once everything falls apart? The three witches, in costumes that look like a modernist painting come to life, are omnipresent, swarming over each new corpse and bringing them back again to lurchingly haunt the living. This sense of frenzied encroachment suits the breakneck pace of the production. It clocks in at just about 100 minutes, though Buffini’s adaptation still feels fully-fleshed, particularly thanks to the ensemble’s wholehearted performances, which make every scene feel weighty. Small relationship moments are carefully observed: Malcolm and Donalbain clasping hands, Fleance leaping onto her father’s back, Lady MacDuff and Ross’s exasperated frankness with one another. The pared-back production, devoid of the usual buckets of blood or even actual weapons, places all the focus on the characters and performances, and certain scenes are able to resonate in a different way when there’s no gore to distract you. All that said… it’s still yet another Macbeth. The marketing and program note make much of the production’s ‘gender fluid’ casting, which isn’t exactly groundbreaking at this point, and feels even less original here, where all the actors are roughly uni-aged, given that stereotypically female-heavy university acting troupes have been casting women in men’s roles for generations. There’s no play with nonbinary pronouns or even with particularly unconventional gender presentation: the women swap between skirts and trousers, but the only two men who don’t wear trousers still wear a resolutely male coded kilt and hakama, respectively. The exception is one of the witches, in a tutu and tottering heels, but one witch does not a concept make. It’s almost strange, the degree to which the production has decided to frame what is by this point almost perfectly ordinary casting as something revolutionary and strange. Entering primed by this angle in the marketing, I couldn’t help but wish a crop of new actors would have something more radical to say about and do with the presentation of gender onstage. As a showcase for its performers, though, the production amply succeeds. But this Macbeth doesn’t quite find a way for its talented young voices to turn what has to be the most-produced Shakespeare play of the year into something as fresh and exciting as they are. Macbeth runs at the Garrick Theatre until 7 December. More info here.